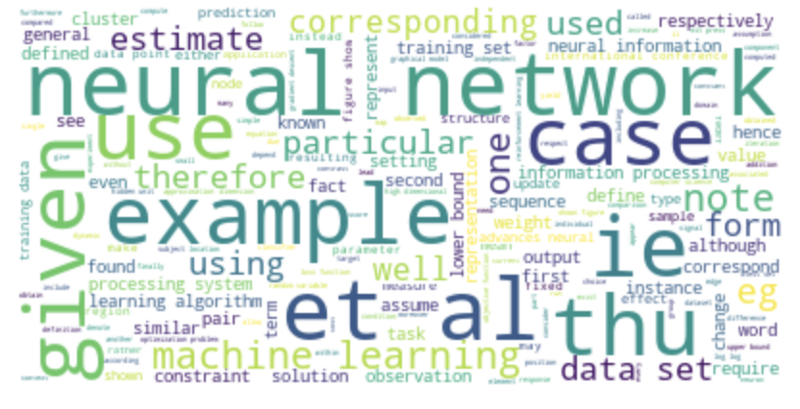 Topic Model: In a nutshell, it is a type of statistical model used for tagging abstract “topics” that occur in a collection of documents that best represents the information in them. Many techniques are used to obtain topic models. 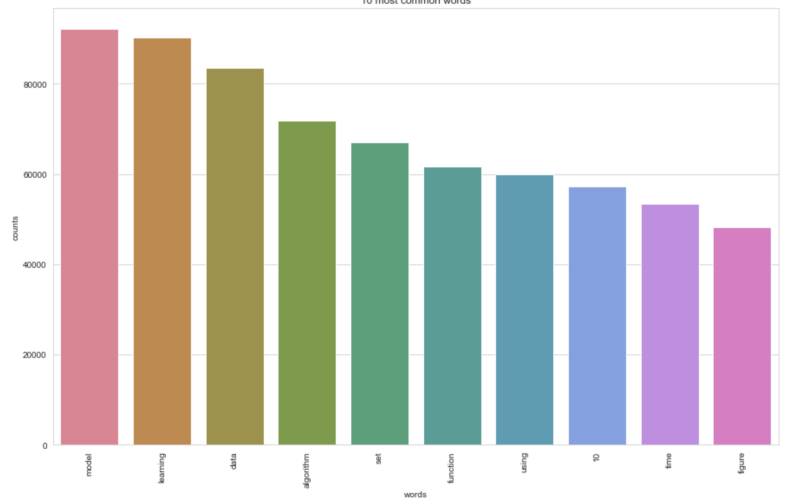 This post aims to demonstrate the implementation of LDA: a widely used topic modeling technique. By definition, LDA is a generative probabilistic model for a given corpus. The basic idea is that documents are represented as a random mixture of latent topics, where each topic is characterized by a distribution of words. 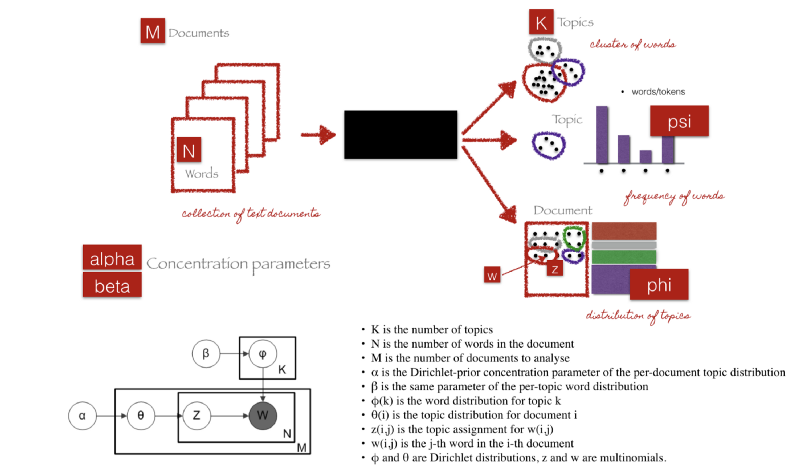 Alpha parameter is Dirichlet prior concentration parameter that represents document-topic density — with a higher alpha, documents are assumed to be made up of more topics and result in more specific topic distribution per document. Beta parameter is the same prior concentration parameter that represents topic-word density — with high beta, topics are assumed to made of up most of the words and result in a more specific word distribution per topic. For this tutorial, we’ll use dataset of papers published in NIPS conference. 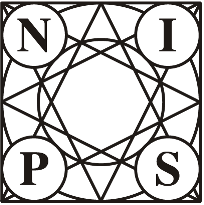 The NIPS conference (Neural Information Processing Systems) is one of the most prestigious yearly events in the machine learning community. At each NIPS conference, a large number of research papers are published. The CSV file contains information on the different NIPS papers that were published from 1987 until 2016 (29 years!). These papers discuss a wide variety of topics in machine learning, from neural networks to optimization methods and many more. First, we will explore the CSV file to determine what type of data we can use for the analysis and how it is structured. A research paper typically consists of a title, an abstract and the main text. For the analysis of the papers, we are only interested in the text data associated with the paper as well as the year the paper was published in. Since the file contains some metadata such as id’s and filenames, it is necessary to remove all the columns that do not contain useful text information. Now, we will perform some simple preprocessing on the paper_text in order to make them more amenable for analysis. We will use a regular expression to remove any punctuation in the title. Then we will perform lowercasing. In order to verify whether the preprocessing happened correctly, we can make a word cloud of the text of the research papers. This will give us a visual representation of the most common words. Visualization is key to understanding whether we are still on the right track! In addition, it allows us to verify whether we need additional preprocessing before further analyzing the text data. # Join the different processed titles together. LDA does not work directly on text data. First, it is necessary to convert the documents into a simple vector representation. This representation will then be used by LDA to determine the topics. Each entry of a ‘document vector’ will correspond with the number of times a word occurred in the document (Bag-of-Words BOW Representation). Next, we will convert a list of titles into a list of vectors, all with length equal to the vocabulary. We’ll then plot the 10 most common words based on the outcome of this operation (the list of document vectors). As a check, these words should also occur in the word cloud. The only parameter we will tweak is the number of topics in the LDA algorithm. Typically, one would calculate the ‘perplexity’ metric to determine which number of topics is best and iterate over different amounts of topics until the lowest ‘perplexity’ is found. 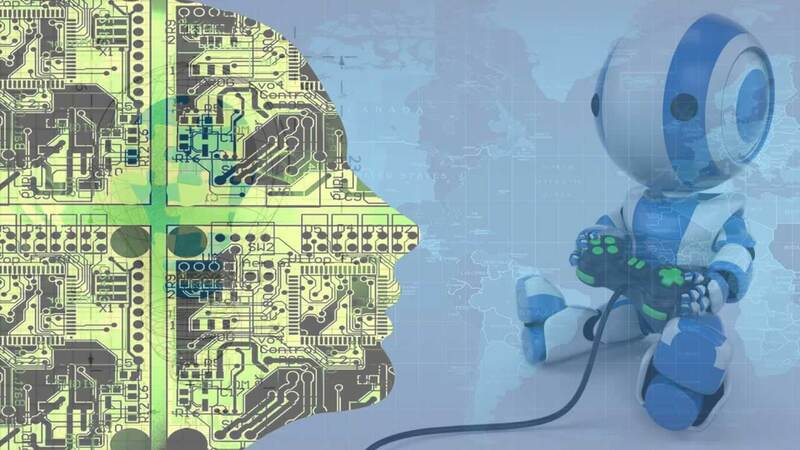 We’ll cover the model evaluation and tuning concept along with exploring Gensim, widely used natural language processing toolkit, in the next article. Better understanding the relationships between the topics. 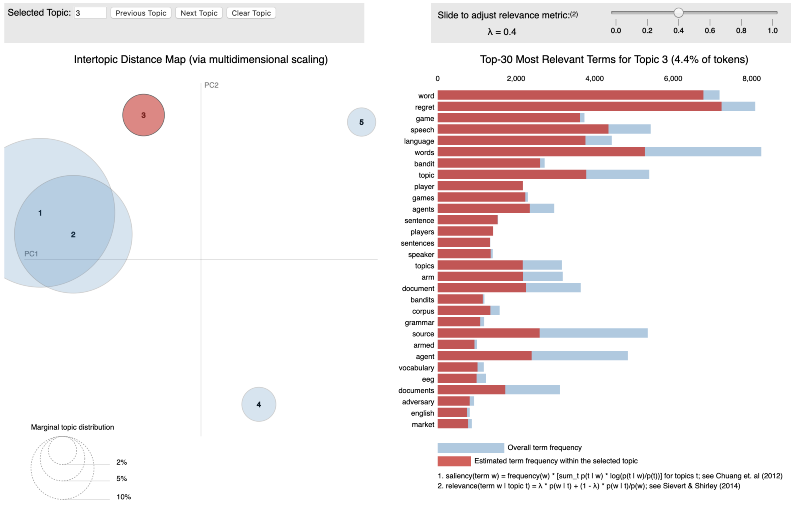 For (1), you can manually select each topic to view its top most freqeuent and/or “relevant” terms, using different values of the λ parameter. This can help when you’re trying to assign a human interpretable name or “meaning” to each topic. For (2), exploring the Intertopic Distance Plot can help you learn about how topics relate to each other, including potential higher-level structure between groups of topics. 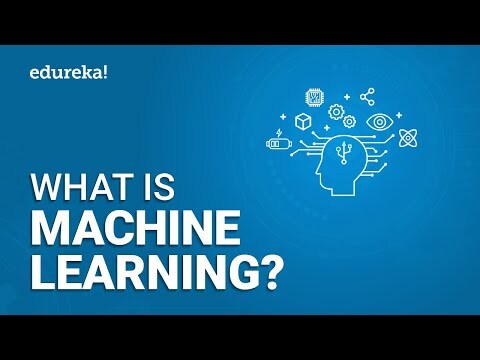 Machine learning has become increasingly popular over the past decade, and recent advances in computational availability have led to exponential growth to people looking for ways how new methods can be incorporated to advance the field of Natural Language Processing. Often, we treat topic models as black-box algorithms, but hopefully, this post addressed to shed light on the underlying math, and intuitions behind it, and high-level code to get you started with any textual data. As described above, in the next article, we’ll go one step deeper into understanding one can evaluate the performance of topic models, tune the hyper-parameters to get it to the point that could be deployed into production.